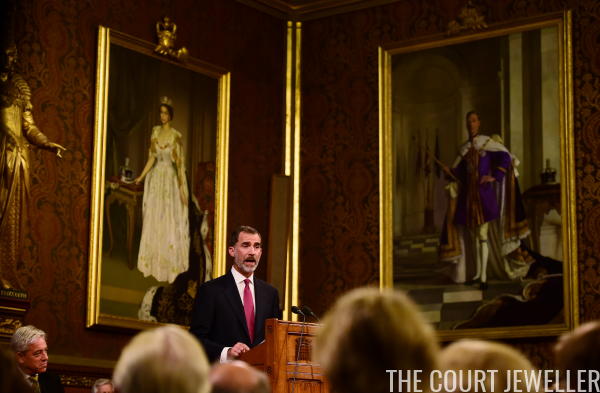 On Wednesday afternoon, King Felipe and Queen Letizia of Spain continued their state visit to the United Kingdom with events in London, including the king's address to parliament. 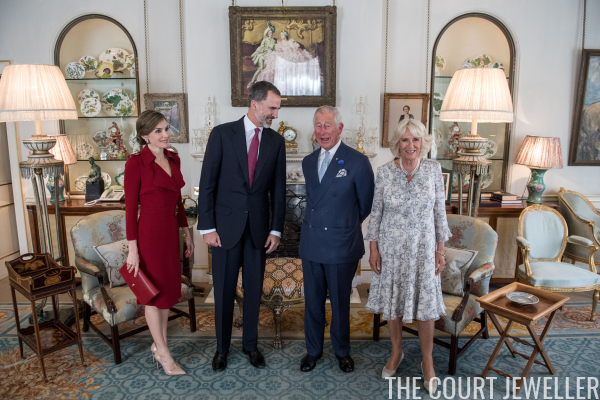 Felipe and Letizia also stopped by Clarence House, where they were hosted by the Prince of Wales and the Duchess of Cornwall. Camilla wore the same outfit and jewels (sans coat and hat) that she did for the welcome ceremonies in the morning, but Letizia made a quick change into an outfit by a British designer, Burberry. She also changed her earrings. 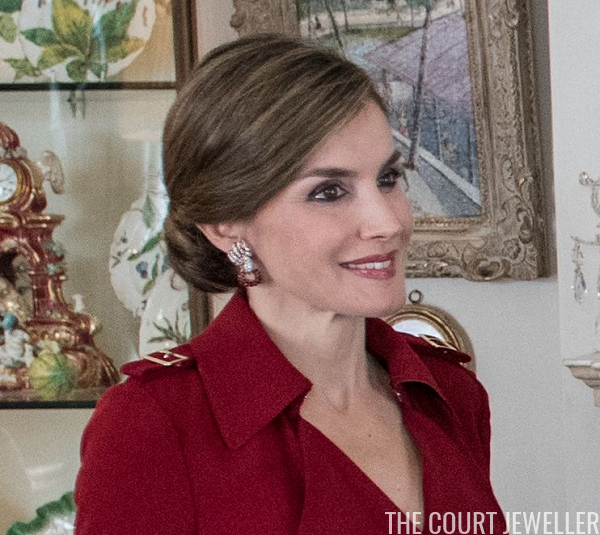 These ruby and diamond earrings feature a dove holding a wreath; they're from a suite of Saudi jewels that belong to her mother-in-law, Queen Sofia. Letizia recently wore the earrings during the state visit to Japan; see that previous appearance over here. 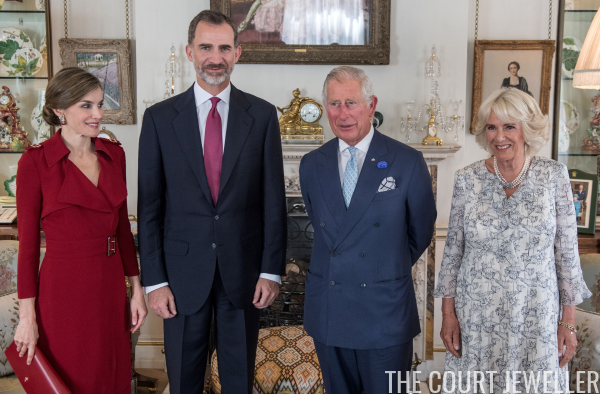 Letizia wore the same ensemble and jewels to the Palace of Westminster, where King Felipe received a standing ovation for his speech before parliament. 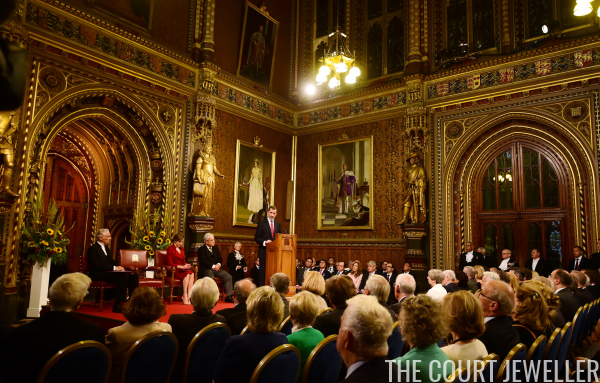 Next up: jewels of the state banquet! Stay tuned!